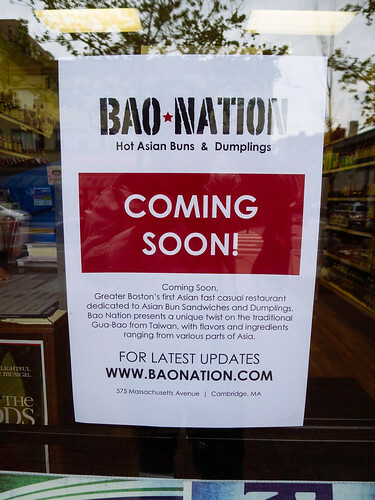 Yesterday Eater Boston editor Rachel Blumenthal broke the news that Bao Nation will be opening in Central Square, and I stopped by to check it out. The location is right between Dosa Factory and H-Mart on Mass Ave in the heart of Central Square. Dosa Factory has been a favorite of mine for South Indian street food for years, and the H-Mart Korean supermarket opened just last month, 2 doors down, with a mini food court offering ramen and korean style curry. According to Rachel's article, the owners of Dosa Factory will be bringing Taiwanese dumplings and Bun sandwiches to the neighborhood, making creative use of the rear of Libby's liquor store. Dosa Factory is built in the rear of the Shalimar Indian grocery, with a full kitchen and seating for close to 20. Bao Nation follows a similar model, but with a much smaller kitchen area and what appears to be standing area for under 20 or so diners. Don't be surprised to see Cambridge City Councilor Leland Cheung proclaim Central Square a Designated Dumpling Destination, as Bao Nation joins both the Dumpling Room (formerly Pu Pu Hot Pot) and the recently opened Dumpling House. Look for frequent updates from the growing Central Square Street Food Cluster, as I'm in the neighborhood twice a week for a music production class at MMMMaven right across the street!.